This entry was posted on January 8, 2010 at 9:57 AM and is filed under baking, recipes, whole grains. You can follow any responses to this entry through the RSS 2.0 feed. You can leave a response, or trackback from your own site. A friend and I have been talking at length about good granola. He’s on a quest to find some decent store-bought and after several failed attempts recently resolved to make his own. I just stumbled on a recipe the other day for him, and will now forward this one. I am fully faithful that what comes out of the Hotel Healdsburg will be delightful. Granola spiked with moonshine for us freelance writers, love that thought, Tara. Ever since I started making my own granola, I can’t eat the store-bought variety — too sweet. What I like about making my own is that I can put in what I want and omit what I don’t like (those weird extruded dates in some of the bulk granola — or maybe it’s the muesli — kind of remind me of animal poop … but I digress). Mine is very simple: oats, slivered almonds, sunflower seeds, rice crispies (the generic kind you get in the bulk bins), dried cranberries, a dash of cinnamon and nutmeg, some butter (I usually put in a lot less that the recipes call for) and honey. Oh, and I like it when the granola has clumps. Yes, exactly, MP, you can custom your granola to your personal tastes and experiment with less sugar and fat as you do so. I like the sound of your clumpy, extruded-date free kind. 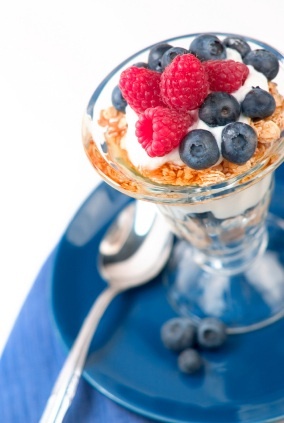 These recipes for granola…yum! And I love the title of your blog, too. Thanks, Meredith. And happy snacking! MMMmmm, this sounds like my kind of granola–not too sweet and packed with nuts and coconut. The only ingredient I think I’d tweak would be the cinnamon. For some reason every granola recipe seems steeped in cinnamon. While I don’t mind a little, I’d rather taste more of the other ingredients. I know what you mean about cinnamon, a little can go a long way. Feel free to modify as your taste buds see fit. I like the thought of granola, the crunchy texture playing against the smooth creamy yogurt – but as we have a nut free house, it is really difficult to do. Any ideas? And don’t be shy about customizing to suit on the dried fruit front. I’ve been making organic granola for the guests at my green B&B on Cape Cod for five years now. We serve it with homemade yogurt and fresh organic fruit. Guests often leave with the recipe, which is quite similar to yours. If everyone knew how easy it is to make, the store-bought variety would become merely a convenience item. Well said, Alexandra. A green B&B on Cape Cod…sounds divine…do tell me more. This looks like a great recipe. I’ve been buying some from a local producer but it is ridiculously expensive. I know what you mean, marthaandme, granola has definitely become a gourmet item in recent years. Making your own is not only simple and tasty, you can save some money as well. There’s nothing better than good granola! Lucky you, to be the extra tag-along on the exhaustive (?) spa trips. I spent some time in Healdsburg last June and fell in love with it. Gotta try this recipe – thanks! Healdsburg is lovely, isn’t it, Sheryl? Hope you enjoy the recipe. Love, love, love granola! I’ll have to try making my own, since the store bought kind can get expensive. I think you’ll find, Susan, that making your own is pretty easy. Give it a go and see what you think. Loved your post. And, big fan of granola. My favorite is Cafe Fanny Granola. And, printed out your suggestion for granola from Yoga Journal. Must try it. Like your style! Thanks, Judy. Glad to hear you’re going to give Mollie Katzen’s granola a try. Since you’re a fan of Cafe Fanny Granola I think you’ll like this version too. Enjoy. I’m in search of a granola that is nut free, as I have an allergy to tree nuts. So I won’t be able to sample this recipe, but I enjoyed reading the story behind it. You’re not alone! See my reply to Lisa above for a nut-free granola recipe. The cool thing about a granola recipe is you can modify to suit your dietary needs. How funny that you’re writing about granola this week as I just made granola for the first time this week! I tried Karen Demasco’s recipe and loved it!! Will have to try this one too. Lovely blog!! Can’t wait to see more. I’m curious, Almost Slowfood, is the Karen Demasco granola recipe from her book The Art of Baking? Do tell. I love granola especially with yogurt and raspberry mush. I’ve started making my own granola from scratch and I’ve been surprised by how easy it is. Whenever I’m baking anyway, I throw a new batch of granola in the oven. My recipe is not too different from this one but it has a lot less sweetener. I usually just put a little agave on it and that’s all. Love the idea of making a batch of granola when the oven’s on anyway. And I agree on the sweetener front, I find you can often use much less than a recipe calls for without sacrificing taste. You’ve just inspired me to make granola. I may have to try this. 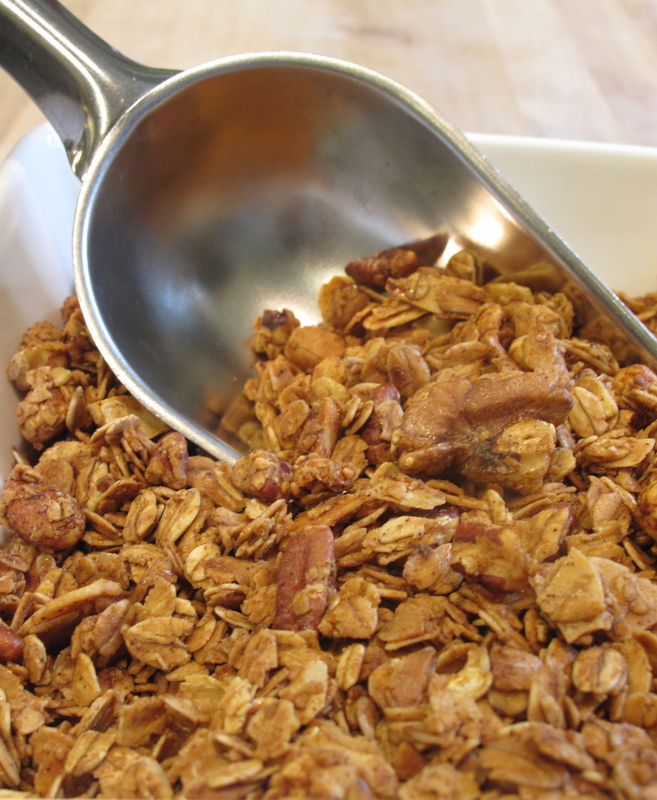 I have my favorite stand-by granola recipe, but sometimes a change is nice! Everywhere I look people are talking about granola. Today’s San Francisco Chronicle, my local paper, includes a feature “Granola gets a makeover,” by Amanda Gold, which includes five different recipes for this breakfast cereal.